This is a thumbnail view of the full six months of hourly temperature data. The graph starts at 0 deg C and the minimum temperature in May was 4.5 degrees C. The maximum temperature was reached Aug 2, 2009 when it reached 15 degrees. The full Excel spreadsheet showing graphs of each month and the raw data is available from the Research Centre. Simply leave a request in the “Comment” box or e-mail us. 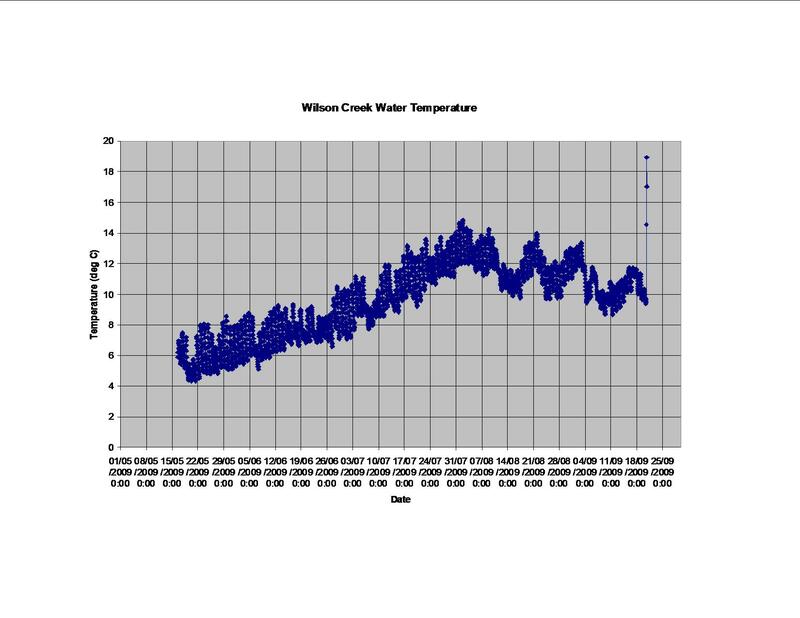 Hello, I am interested in the following: The full Excel spreadsheet (for Wilson Creek water temperature data) showing graphs of each month and the raw data is available from the Research Centre. Many thanks. I have more data than the thumbnail shows. so that I can send it to you directly.